In light of the twenty-fifth anniversary of the Teenage Mutant Ninja Turtles (TMNT), I thought it fitting to pay tribute to one of the best and more obscure offshoots of those comic book turtles: the TMNT role-playing game. When you mention Teenage Mutant Ninja Turtles, most people immediately think of the clownish children's cartoon, with its infectious theme song and villainous buffoons. The original incarnation of the TMNT franchise was a dark, gritty, violent black-and-white comic book, and that version of the turtles was the inspiration for the classic Palladium Books RPG Teenage Mutant Ninja Turtles and Other Strangeness. 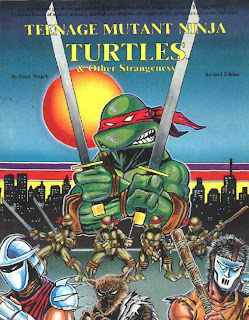 Full of illustrations by Kevin Eastman and Peter Laird, the original creators of the TMNT, Teenage Mutant Ninja Turtles and Other Strangeness was much more than a slapdash licensed RPG, like so many spin-offs from other intellectual properties. Instead, Palladium Books created a RPG system for creating a multitude of mutant animals (samurai aardvark? raccoon assassin? no problem), from a variety of backgrounds. Players could take the role of any kind of mutant animal they could imagine. From zoo animals like tigers or baboons, to pets like parakeets or housecats, TMNT & Other Strangeness allowed players to slip into the role of a ninja, super-spy, assassin, other any of a multitude of backgrounds, all wrapped up in the form of a mutant animal. The setting was gritty and urban, just like the original comic books. Palladium Books created not just a extension of the TMNT's adventures, but a whole world of mutant animals and villainous scientists, evil psychics and ninja assassins. While most people just remember 'heroes in a half-shell', when I think of TMNT, I will always remember TMNT & Other Strangeness.